Now here is a real biodiesel champion. Last night, the NBB honored staff member Lola Helming, with the Dedicated Service Award. 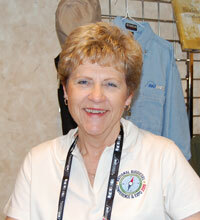 Helming has been the office coordinator for 15 years and was NBBâ€™s first official employee. Most who have contacted the NBB headquarters have received Helmingâ€™s warm greeting, and she has helped to keep the office running smoothly from biodieselâ€™s research days to the half-billion gallon industry it has become.